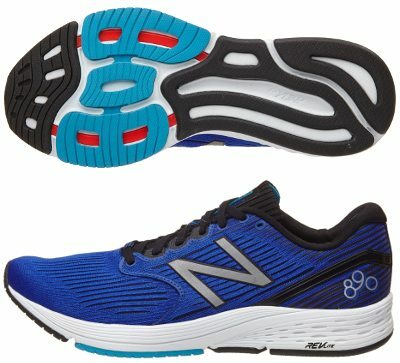 New Balance 890 v6 are neutral performance running shoes. Many people complained and finally the well known american brand released the New Balance 890 v6 most probably because of lack of success from other options suggested by New Balance. On one hand the direct successor Vazee Pace v2 did not consolidate expected sales figures and "Vazee" lineup was targeting casual (sneakers) instead of running market. On the other hand the successful Fresh Foam Zante v4 is a more responsive one and gets great traction among runners. So it seems New Balance tries to recall great reputation from 890 saga and capture the attention from standard runners, those who actually pay for running shoes. There is a custom London edition as marketing promotion to celebrate one of the most popular marathons around the World. Theorical predecessor would be the loved 890 v5 but current 890 v6 could be considered as brand new one (even drop gets down to 6 mm) which keeps naming because of great reputation among potential buyers. Upper is very clean and based on breathable mesh plenty of ventilation holes. Bootie construction features ergonomic design for enhanced flexibility in a similar way mentioned above Fresh Foam Zante v4 does although 890 v6 uses a soft touch, more conventional fabric instead of innovative HypoSkin. Midsole in 890 v6 is completely made of reliable REVlite foam delivering great blend of firm cushioning and superb response, a solution already seen in faster 1400 v5 which has been improved with TPU strips particularly designed not only for quicker toe-off but also increased stability, although not at the same level that Vazee Prism v2. There is no much rubber to remove from outsole so minimal configuration keeps weight low with four different areas with specific stiffness for smooth transition.